I had a day off work today and went with the girls, and a local playgroup, to Shepreth Wildlife Park. We went on the train, which was a treat in itself for our girls who rarely get to travel by train. We had a good time showing the girls various animals. After lunch we hit the playground, which was a big hit with all the kids. ThingOne seemed to particularly enjoy the trampoline. 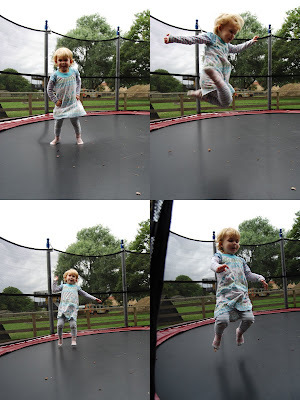 Contrary to what several people said when they saw ThingOne's gleeful bouncing, or the photos of said bouncing, WE ARE NOT GETTING A TRAMPOLINE IN OUR GARDEN.